Earlier in the week we posted about Not A Cornfield, a “living sculpture” cultivated on a brownfield site in Los Angeles. 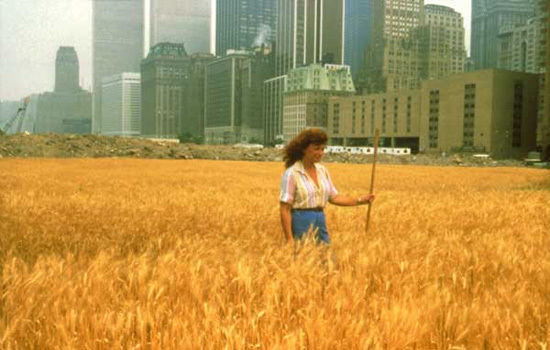 A few days hence we are reminded of Wheatfield by Agnes Denes, a public sculpture/installation/performance/subsidized farmland (take your pick) for a landfill area in Lower Manhattan and where Battery Park now sits. 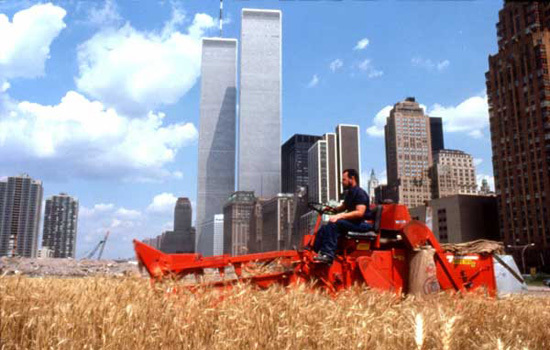 For about a year, Agnes Denes prepared the brownfield site by removing the junk and debris from the construction of the World Trade Center. She uprooted weeds and collected all the plastic bags that drifted in. She even installed an irrigation system. And then, passing through the shadows of the still-standing WTC towers and expertly weaving through Manhattan's notorious traffic, trucks after trucks brought in a new layer of topsoil, a sort of homecoming to where they've been displaced previously by concrete, asphalt and high rises. 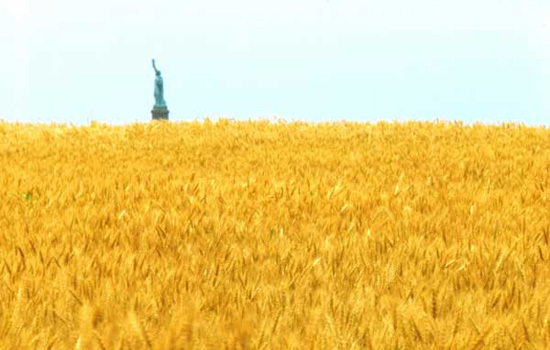 The following year, New York City—that quintessential modern American city—had its own amber waves of grain to be harvested at the end of the (urban) agricultural calendar. However, we are more apt to say it was a culture-meets-culture non-confrontation. At least for us, farming—in its massively industrialized, complexly regulated American form—is no longer emblematic of nature. And in many ways, farming is far removed from the genteel picture of rural life: a hot summer afternoon in the country, peace, forgotten values, simple pleasures. As related to us by an agroeconomist friend, the life of a typical American farmer may now consist of an early morning check-up of international futures markets and then the day's weather over high-speed internet connection; a ride on a John Deere equipped with a GPS system to plant/inspect/harvest their GMO crops fed with cutting-edge super fertilizers; a check-up of their livestocks injected with genetically modified hormones; a listen to world news on 24-hour cable news channels, etc. In other words, these are not country bumpkins but 21st century technophiles. POSTSCRIPT #1: Agnes Denes qualified and so applied and then subsequently awarded monetary subsidies from the US Department of Agriculture. Vis-a-vis this: "But I'm more apt to say it was a culture-meets-culture non-confrontation. At least for me, farming, in its massively industrialized, complexly regulated American form, is no longer emblematic of nature." See this: Against the Grain by Richard Manning. A bit self-consciously oppositional at times, but interesting nonetheless. Not an urgent read, however. A very nice complEment to the post. A quick Google on Richard Manning returned a link to this blog entry from How to Save the World. Some of Manning's arguments are summarized and commented there, so a recommended stop for those, like myself, trying to decide whether to buy or borrow the book or neither. P.S. The URL wasn't placed inside the necessary quotation marks (i.e., href=""). P.S. TinyURL.com may save prevent some headaches in the future. Totally disagree. However technologized modern agriculture may be, the sight of food -- and lots of it -- growing in such an urban context was and is a shock. The disconnect between farm and plate is a distinctly urban scenario -- hence the effectiveness (and delightful growth -- hopefully sustainable) of the current urban farming movement. Presented some of these images to a room full of policy wonks at a regional summit on the condition of a urban stream in North Buffalo, in the context of a show I curated on the subject. Transformative capabilities of art and such. It got an audible gasp. Furthermore, isn't that nature vs. culture dichotomy dead already? It's all ecology!